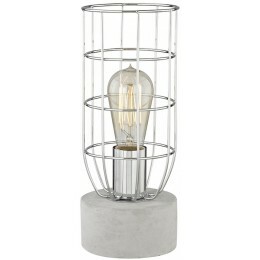 The Wardenclyffe table lamp pairs sleek polished concrete with an Industrial-esque openwork metal shade finished in chic polished nickel. offers an updated contemporary silhouette with urban complexity and a hip "machine-shop" feel. Enhance the effect with one of our stylish exposed-filament bulbs.